It was almost 1400 when we were cleared to disembark in Bermuda. It may surprise you to learn that I have never been here before. 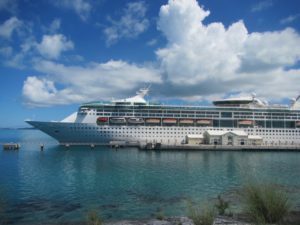 It has not be a stop on Royal’s routine TransAtlantic repositioning cruises but a good place to transfer patients needing hospitalizations. Like many other locations in this area of the Atlantic & Caribbean, it was used by the Portuguese and Spanish. Neither country were into colonization in the area; more like looting and locations for slave trading after the 1500s. Bermuda, or rather the British has a worse reputation than many other locations. When you colonize, as the English (and occasionally the Scotts) were wont to do – you need labor. Until 1834, that meant slaves. When the impact of Dr Livingston became clear, the English moved to the next best thing – convicts. Why send those with shorter sentences all the way to Australia, tying up men, ship and resources when you can drop them at Bermuda to build your Naval facilities and provide labor for plantations, mining or what-have you. And if you finished your sentence? You could then be still sent to Australia! Which then leads us to the Boer Wars. It wasn’t sufficient to decide that one’s country had the obligation, much less the right to colonize huge swaths of Africa. No, one had to bring one’s own colonials, religion and control. Which means battles, pitting tribal chiefs against each other and use of some rather more modern weapons than in the possession of the locals. 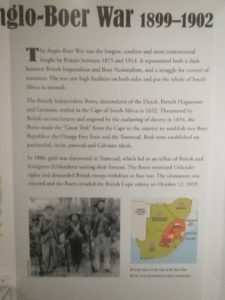 (Go read up on the Zulu Wars….). So how do you handle the displaced Africans and Boer families? 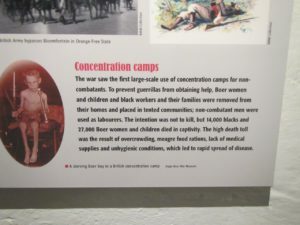 Why you set up concentration camps where more than 14000 Africans and 27000 Boer Women and Children perished through crowding, lack of health care and malnutrition. And, if you now need more labor in Bermuda – you set up POW camps where no one has a chance of escape and going back to the fight. We docked at the Royal Naval Dockyards and could see the fortifications from our balcony. The Fort and associated Colonial Buildings have been turned into a museum which has some excellent and very blunt exhibits which I highly recommend. As I walked the embankments and looked out at the ship – I started thinking how “we” have romanticized the Victorian Era. Clothing, manners, steampunk take offs, Sherlock Holmes, multiple other mysteries and authors. Few of these seriously look at the underpinnings of that society with hundreds of thousands of starving poor in London, famine and unrest in Ireland, or the amount of tragedy in other areas of the British Empire which served as the under pinnings. It is not a time or place in which I would have cared to live. Grateful in the 21st century for sure. We have noticed that the islands that were ruled by the British seem to be in better shape than the others. Hmmm. May have to do with class society and everyone staying in their place. That and a severe love of bureaucracy ….